... YOU CAN BANK ON! DON'T BANK ON IT! book Offers 20 New Warnings! When it comes to financial matters, who can you trust? In fact, authors Smith and Ponte had to keep updating this earthshaking new 256-page book because their amazing predictions kept coming true coming true as printing day neared! Most of today's so-called economic "experts" offer plenty of financial market predictions, yet no accountability later on. We think the best test is how accurate an economist or expert has been in the past. Here are 20 predictions Craig and Lowell have made over the last five years. Another 20 sober new warnings for the next five years can be found in DON'T BANK ON IT! 1. 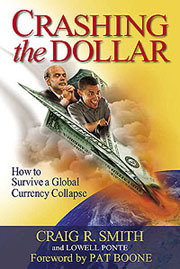 Beginning with their 2010 book CRASHING THE DOLLAR, monetary expert Craig R. Smith and veteran think tank futurist Lowell Ponte warned that vast government economic stimulus spending would not only fail – but would also be an "anti-stimulus" (page 182) that made things worse, not better. As they predicted, the stimulus caused fear and an expectation of high inflation that frightened businesspeople out of hiring and investing. This made the economy worse. Keynesian economists in the White House predicted that huge stimulus by printing trillions would produce $1.50 in growth for every dollar they conjured out of thin air. 2. In CRASHING THE DOLLAR, Craig and Lowell also warned of the coming bulldozing of homes and economic madness in Detroit (p.52); of the economic peril of the "dark matter" of the "money universe," hundreds of trillions of dollars' worth of derivatives (pp. 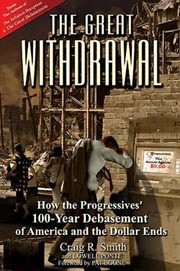 100-103), and of how America's "life-or-death long-term bet" that we could turn China capitalist "before we transferred enough wealth to make it militarily superior to us" appears to be a losing wager (p. 23). 3. Craig and Lowell in CRASHING THE DOLLAR also warned that President Obama was a threat to use the Internal Revenue Service (IRS) as a political weapon (pp. 125-126), a prediction that proved to be chillingly accurate as two years later the IRS had targeted conservative and tea party 501(c)3 organizations. 4. 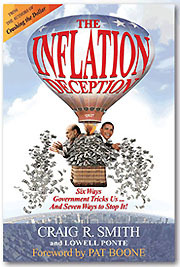 In their 2011 book THE INFLATION DECEPTION, Craig and Lowell warned that a withholding of services by America's overtaxed producers was coming - not unlike the strike depicted in Ayn Rand's novel ATLAS SHRUGGED. Companies were keeping $3 Trillion overseas, beyond the reach of U.S. tax collectors (p. 58), and what today we call "tax inversions" were soon to begin. 5. They predicted that the mere existence of a Big Government political party able to win control in any election produces a "Donkey Effect," a drag that reduces business confidence and investment by roughly 25 percent (pp. 197-198, 201-202). 6. Craig and Lowell explained the genetic basis for American Exceptionalism in a specific "entrepreneurial" gene more common in those who chose to come here than is found elsewhere. This gene predisposes us to seek religious and economic freedom. They predicted that this raises our risk of stress-related diseases such as hypertension and cancer as Progressives turn America into the kind of Big Government society our ancestors fled to come here. Craig and Lowell warned that this same gene that made America successful is now, under Progressive Big Government, disproportionately killing the descendants of American pioneers. (p. 131-136). 7. The Federal Reserve, warned Craig and Lowell, is rapidly becoming a Fourth Branch of Government and the planner and regulator of our entire economy...an odd role for an entity supposedly created to keep politics out of monetary policy (pp. 54-55). 8. Fed policies, they warned, are crowding out small businesses from access to loans, and diverting those loans at rock bottom interest rates to government itself (p. 27). 9. Craig and Lowell were the first popular economics writers to point to evidence that several hundred billion dollars in foreign money used in "bear raids" against American banks were a key trigger of the near-collapse of the U.S. economy in 2008 (p. 28-31). 10. 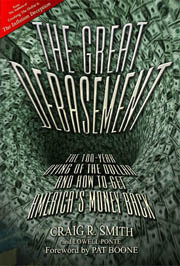 They explained how America had become an "Inflatocracy", with a government of, by, and for inflation, a hidden tax (p. 189). 11. In their 2012 book THE GREAT DEBASEMENT, Craig and Lowell noted the emerging paradox that the stock market now goes up on bad news in the economy and down on good news. This is because all that now matters in the stock exchange casino is whether events will force the Federal Reserve to keep conjuring more trillions of paper dollars out of thin air. Stocks no longer have much to do with how well companies make or sell products (pp. 21-22). 12. Government stimulus policies, predicted Craig and Lowell, would henceforth produce not only a "multiplier effect" but also a "divider effect" by more heavily taxing some to buy the votes of others (pp. 85-86, 115-117). 13. They predicted more and more terrifying Middle Eastern and other terrorism that could involve the damage caused to global banking by EMP (Electro-Magnetic Pulse) devastation of computerized bank records (pp. 175-178). 14. Craig and Lowell predicted that in the emerging "cashless society" the government will impose an automatic 20 percent tax on every transaction (pp. 220-221). 15. And they predict the possible emergence of a new gold-based Islamic coin and other challengers to the world's paper currencies, including today's "global reserve currency," the U.S. Dollar (pp. 246-249). (f) Savers withdrawing from bank accounts and bonds funds in what looks like a slow-motion bank run. (g) Germany attempting (unsuccessfully) to withdraw their gold on deposit with the New York Federal Reserve Bank. (i) The Federal Reserve withdrawing gradually from its most recent economic stimulus program. 17. Craig and Lowell in this 2013 book also predict that an inflation tsunami is coming (p. 129), and that our government will continue to be a "Crisisocracy", creating and exploiting crises to control and silence Americans (pp. 130-131, 137-138). 18. In their stunning fifth book together, DON'T BANK ON IT! THE UNSAFE WORLD OF 21st CENTURY BANKING, Craig R. Smith and Lowell Ponte predict that your bank account may be hit by any of 20 major threats (pp. 215-219). Each one of these 20 perils is its own prediction, and most have already begun to come true in various ways. Jesse James today would probably be unable to rob your bank, but they reveal that you might have trouble getting what you think of as your own money out of your bank, too. The risks Craig and Lowell reveal are often amazing and always eye-opening. You could lose your banked money to one of 125,000 Chinese cyber-warriors half a world away; to greedy banksters; or to rapacious spendaholic politicians who desperately need ever-more revenue to keep expanding the welfare state. 19. Your bank account exists only in a bank computer, not a bank safe, and is being robbed systematically right now. 20. Banking (as we know it) will soon die, Craig and Lowell predict, as will our old notions of money. The dawning "cashless society" and "Internet of Things" that are taking over will be convenient, costly, and risky. You might soon even be robbed via computer chips built into your next refrigerator, Craig and Lowell predict. 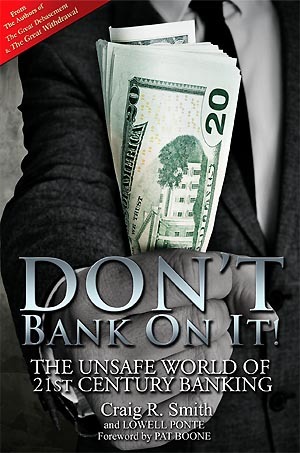 Seize this opportunity to receive a FREE review copy of DON'T BANK ON IT! THE UNSAFE WORLD OF 21st CENTURY BANKING. Call 800-289-2646 or Register here. Your bank account is systematically being robbed, and is at serious risk of being seized and looted. How much interest is your bank paying you to put your money at such risk? Less Than Zero Percent! Monetary expert Craig R. Smith and futurist Lowell Ponte show why it has become illogical - and hazardous to your wealth - to trust your money to today’s increasingly vulnerable and unsafe banks. Get Your FREE copy of DON'T BANK ON IT! THE UNSAFE WORLD OF 21st CENTURY BANKING TODAY!